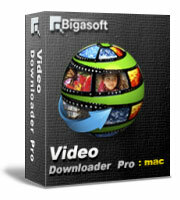 Bigasoft WebM Converter for Mac is perfect WebM video converter for Mac OS X users to create and convert WebM video. As royalty-free, open video compression format, WebM is excellent for HTML video and provides no less than video quality than H.264 as well as supported by many browsers. By the help of Bigasoft WebM Converter for Mac, it is quite fast and easy for you to create WebM, HD WebM and convert your video files to WebM from any formats video including MP4, AVI, 3GP, FLV, MKV, H.264, RM, RMVB, VOB,SWF, Xvid, DivX, HD, AVCH, MTS, TS, WMV, M1V, M2V, MPG, DV and from your working flows like iMovie to WebM, FCP (Final Cut, Final Cut Pro) to WebM and many more. 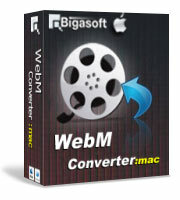 Bigasoft WebM Converter for Mac can also convert WebM to play WebM anywhere, import to iMovie, Final Cut for editing. The WebM Converter is capable of streaming and converting WebM to all key video formats such as convert WebM to MOV, AVI, MP4, WMV, FLV, MKV, VOB, H.264, Xvid, DivX, RM, RMVB, DV, HDV, HD, MTS, TS, MP3, OGG, AAC and MP2 etc. It prepares ready video for iPod, iPhone, iPad, PSP, Zune, mobile phones, Windows Phone, Android phones, etc. With Bigasoft WebM Video Converter for Mac, you may preview video before conversion, capture your favorite scenes, convert video segment, crop black margin, automatically turn off after conversion, merge video files, rotate video to correct degree, select audio track and subtitle you preferred, adjust the parameters to customize output effect and more. 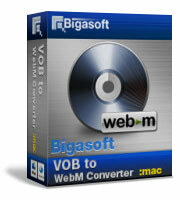 Ready to try or buy Bigasoft WebM Converter for Mac? With the help of OS X WebM Converter, you can convert video to HD 1080p WebM, 720p WebM video, standard-definition (SD) WebM video or lower resolution WebM video (under 640*480 pixels). WebM Video Converter for Mac is ideal WebM conversion software to convert WebM to any desired video formats and convert WebM to audio MP3, OGG, WAV, M4A, AIFF, AAC and more. The WebM Converter for Mac app recently updated to support multi-tasking, multi-core CPU processing and multithreading. WebM conversion on Mac is now 2X faster. With the wonderful WebM Converter Mac you are able to trim only your wanted segment by setting the start time and the end time. You can easily crop your videos to remove black bars and focus video by the WebM movie converter Mac. WebM Video Converter Mac for can merge different source videos as an integrated video file for you to enjoy. Check as many chapters as you like and the ideal WebM video converter will automatically convert them one by one. You can take images from favorite movie by "Snapshot" within Bigasoft WebM Converter for Mac. You can choose the after done action to let Video to WebM Converter and your Mac will automatically shut down after the conversion task is finished. Bigasoft Mac OS X WebM video conversion software supports multiple languages and you can choose from English, German, French, Spanish, Japanese, Arabic, Italian and Chinese. Bigasoft WebM Converter for Mac is highly compatible with Mac OS X v10.4 Tiger), 10.5(Leopard), 10.6(Snow Leopard), 10.7(OS X Lion), 10.8(OS X Mountain Lion), Mac OS X 10.9 (Mavericks) and 10.10(Yosemite).